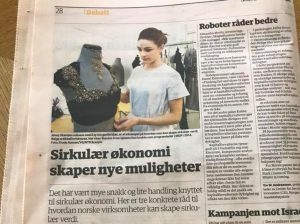 CIRCit Project first results gets attention in the Nordic media. There has been much talk and little action on circular economy. CIRCits PhD candidate Eivind Kristoffer has concluded that there are some key factors for success when it comes to circular economy. What follows are three pieces of concrete advice on how Norwegian companies can create circular value. Click to read the full article in English. Eivind Kristoffer is PhD candidate at NTNU and Infrastructure Engineer at Sopra Steria.